Johnson captured 37 wickets in the 5-0 sweep of Alastair Cook's England in 2013/14 which sparked the exits of a number of senior players and staff. Australia's Nathan Lyon celebrates dismissing England's Moeen Ali (unseen) during the fifth day of the third Ashes test at the WACA Ground in Perth, Western Australia, on December 18, 2017. 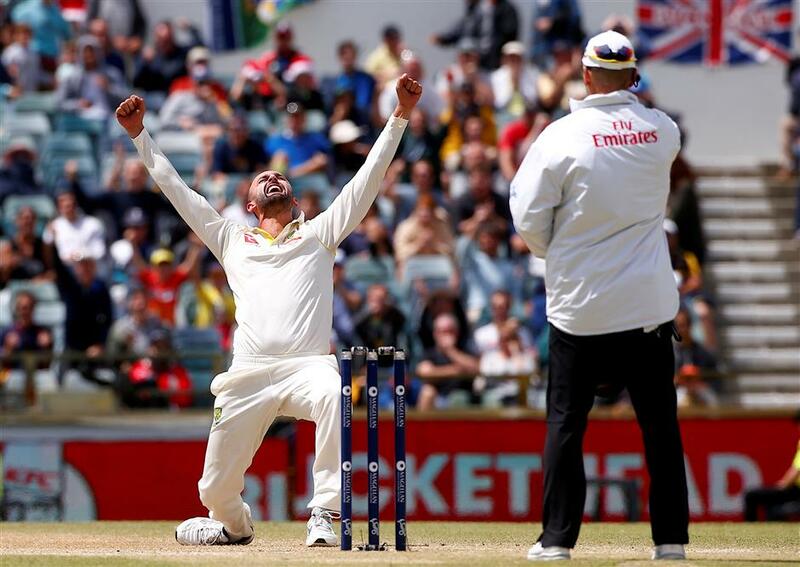 Nathan Lyon's wish to see the end of some England careers after another Ashes whitewash could easily come true if the tourists' struggling senior players fail to lift quickly, former Australia paceman Mitchell Johnson has said. England spinner Graeme Swann promptly retired after the third test of that ill-fated series, while batsmen Michael Carberry and Kevin Pietersen were never seen again in test whites. With Joe Root's team having given back the urn and 0-3 down heading into the fourth test in Melbourne, Johnson said selectors should make hard decisions now rather than wait until the end of the series. "Going to the next test I think England will have to think about changes," the 36-year-old said after training with Big Bash side Perth Scorchers at the WACA. "I'm not sure if (paceman) Stuart Broad is up to it at the moment. There will be some question marks around him, (as) a senior player. "(Opener) Alastair Cook is someone who I think has been thinking about retirement. "I just wonder now with the scoreline being 3-0 whether that will take a bit of pressure off him and he'll just go out there and score runs. I'm not sure. "I think the scars are there from the last series." Cook, who will be 33 when the Boxing Day test starts, scored 766 runs in England's 2010/11 triumph Down Under but struggled with the bat as captain during the 2013/14 series. He has managed only 83 runs in the current campaign at a paltry average of 13.83. Broad has only five wickets from the three matches at 61.80 runs apiece and came off his worst ever test figures in the third match at the WACA. With England's lack of pace exposed on Australian wickets, Johnson doubted it could win in Melbourne or Sydney without a genuine quick, and urged selectors to recall Durham seamer Mark Wood. Australia's Josh Hazlewood celebrates after taking a catch to dismiss England's Alastair Cook during the fourth day of the third Ashes test. "I look forward to him playing if he gets the opportunity, they should pick him even if he’s slightly underdone," Johnson said of 10-test Wood, who recovered from an ankle injury to bowl in the tour match in Perth. "From a pace point of view, someone bowling over 140-145 (km/hour) can definitely change the game." Root, meanwhile, was a "great" player that had failed to stand up for his team with the bat while being saddled with a series of off-field distractions, said Johnson. The left-armer recalled his own wayward bowling during the 2009 Ashes in England when tabloids were awash with reports of a rift with his mother. He felt England's boozy indiscretions during the current tour had probably taken a similar toll on their skipper's on-field performance. "For me '09 was a struggle when you have off-field things happening, personal things that have happened and they’re out in the public," he said. 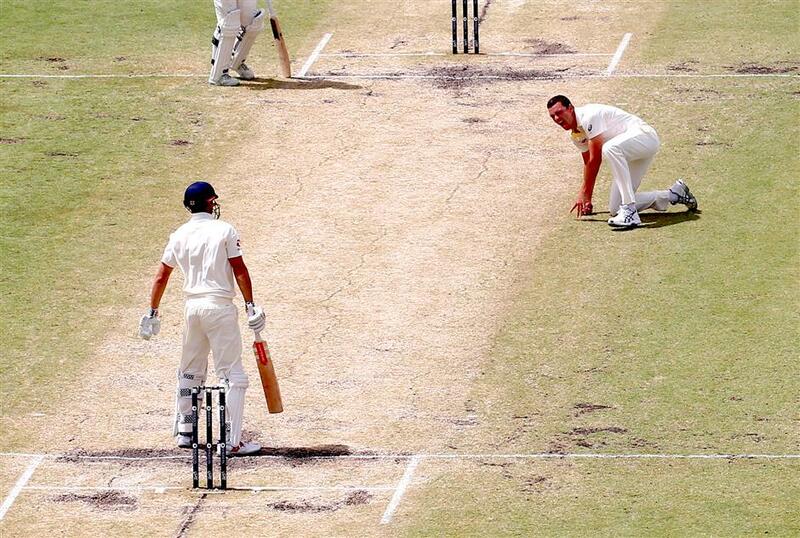 "Because it’s the Ashes you’re definitely under the microscope a lot more. He’ll learn and he’ll definitely get better." Johnson was naturally more generous in his praise of the home side and its captain, with Steve Smith leading brilliantly with a double-century in Perth and 426 runs for the series. The Ashes had been disappointing from a "fan's point of view" but that was of little concern to Johnson, who enjoyed a number of fiery on-field exchanges with England players during his international days. "As an ex-player, I’d love to see a 5-0 (whitewash), I’m not really that fussed on what happens out in the middle. "I don’t like seeing close games when it’s against England, I just want to see them get thumped."